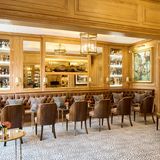 The Leopard Bar within the Rubens at the Palace Hotel is an impressive bar serving over 200 whiskies and 30 Champagnes against a backdrop of live jazz music. 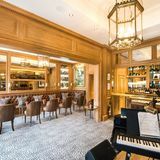 Complete with sumptuous brown leather deep buttoned sofas, glass whisky display cabinets and antique pinewood walls by English panelling specialists Hallidays, the interior offers a spacious yet intimate 35 covers, while outdoor seating provides a palace-side view on warm summer evenings. "The Leopard Bar, is located directly opposite Buckingham Palace Royal Mews, part of the Rubens Hotel but with direct street access and outside seating. Serving over 200 whiskies and 30 Champagnes against a backdrop of live jazz and swing music, the Leopard Bar will bring a new level of sophistication and elegance to Victoria’s nightlife scene. The iconic Leopard Bars of Mrs Tollman can be found in selected properties around the world - each individually designed and unique but sharing the statement pieces of the Bronze Leopard Structure by Donald Greig. Sumptuous brown leather deep buttoned sofas are complemented by antique pine wood panelled walls by English Craftsmen with glass whiskey display cabinets. 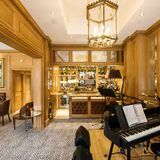 The intimate bar plays a selection of classic jazz and a polished yet warm welcome always awaits. 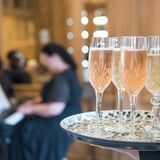 In addition to the impressive selection of whiskies and Champagnes, (all of which are available by the glass including Cristal and Krug Rosé), there will be a range of enticing cocktails, from the classic Champagne Bellini to the more adventurous Buddha Punch. For those looking for an accompanying bite to eat, look no further than our famous Steak Sandwich. Open from Tuesday - Saturday 5pm to midnight." What did you think of The Leopard Bar?